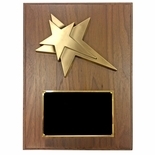 Item Description: 9 x 12 inch large size modern plaque with 6 inch antique brass rising star. Mounted on genuine walnut board. Comes with black and gold engraving plate.